MSA is launching its new V-TEC™ self-retracting lifeline (SRL). It is the first in the market to include an inbuilt retraction dampener which allows the user to release the cable safely via controlled retraction; this prevents potential injury to the user and damage to the main body of the unit. It also offers safe operation and a reduction in costs and downtime. 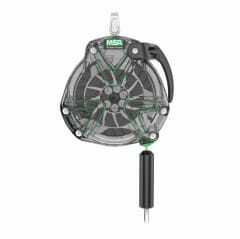 Part of the innovative and easy-to-use V-Series of safety harnesses and SRLs, in addition to the inbuilt dampener, the V-TEC also benefits from patented radial energy absorbing technology which ensures control over any force exerted on it. Together, the radial energy absorber and dampener translate the latest technology into ease of use, inspection and maintenance. The V-TEC SRL is made using stainless steel and engineered plastics for great durability and, when necessary, its cable, energy absorber and retraction dampener can all be quickly replaced on site. A choice of galvanised or stainless cables, is available to meet the needs of different situations. MSA’s new V-TEC 6m self-retracting lifeline is now available from registered suppliers. Other lengths will be launched later this year.